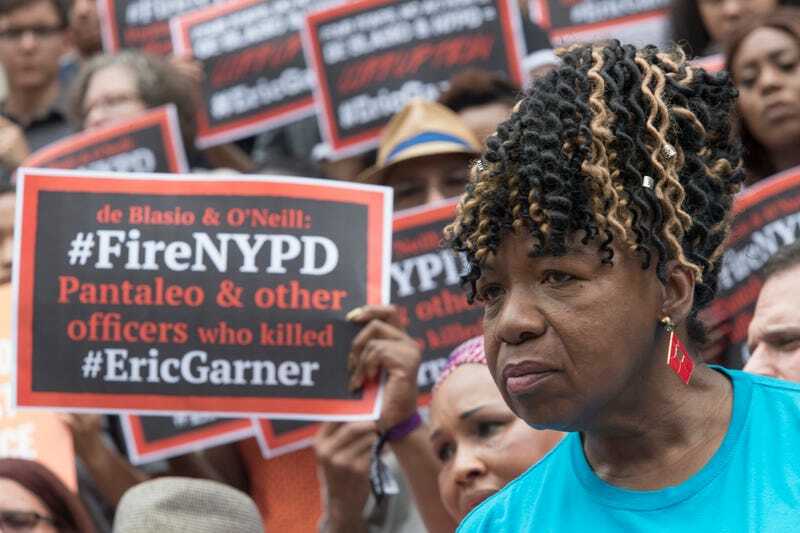 Gwen Carr, whose son Eric Garner was killed by an NYPD officer, surrounded by supporters at City Hall. In the last fiscal year, New York City spent $230 million on more than 6,000 lawsuits settled against the New York Police Department, according to figures released by Comptroller Scott Stringer’s office on Monday. And according to the New York Daily News, the NYPD believes the figure—literally millions spent on suits against the police—is something worth celebrating. According to the Daily News, the settlements factored into the annual report were made from July 2017 through June 2018, totaling 6,472 cases. Of the settlements, $180 million went to cases related to allegations of police misconduct, such as excessive force and false arrest. These kinds of claims reportedly increased from 2017. All of this money, however, hasn’t stopped the department from embracing the figures as a sign that its policing is getting better. The report states that the $230 million in payouts is a 32 percent decrease from payouts from the previous year of $335 million total. Police spokeswoman Sgt. Jessica McRorie said the reduction in claims shows the department’s ability to fight frivolous cases and provide top-of-the-line training to its officers. “These gains represent another example of how the NYPD is building greater trust and respect with the community to collaboratively solve problems, drive down crime, and enhance public safety,” McRorie said. Civil rights lawyer Joel Berger told the Daily News that not everyone negatively impacted by the police department will go through with a lawsuit, and that even with a decrease in settlements and total payouts, 44 percent of claims against the city resolved by judgement settlements in 2018 were against the police department. To use a phrase oft-revered of Kris Jenner: the devil works hard, but the NYPD works harder.